First Listen: Fanfarlo, 'Reservoir' Fanfarlo's upbeat attitude infuses their contagiously melodic music and passionate, dreamy stories. Their new album, Reservoir, reveals itself with each listen: The melodies are full of emotion and the way the songs hang together is delicate and powerful. Hear the album in its entirety. Fanfarlo's upbeat attitude infuses their contagiously melodic music and passionate, dreamy stories. Just before I went to SXSW in 2008 I listened to 800 songs, trying to decide what bands to seek out at the Austin music festival. One that rose above most all the others was Fanfarlo, a London band with a Swedish leader. 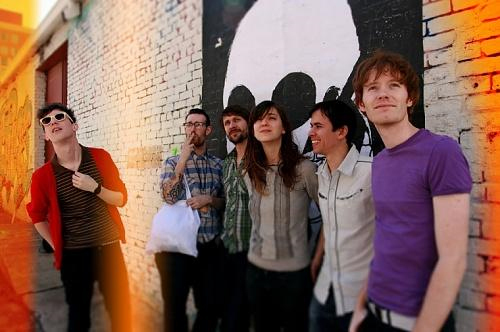 In Austin back in '08 I stood on a small rooftop-turned-makeshift bandstand, where the six members of Fanfarlo went through the most painful soundcheck I'd ever seen (until this years SXSW with Edward Sharp, but I digress). Despite the sound mix nightmare, the band had a contagiously pleasant demeanor. Their upbeat attitude totally infused their music, and then the crowd. It came through in trumpet, melodicas, keyboards, drums, melodic bass and passionate dreamy stories sung by Simon Balthazar. Now, more then a year later, comes Reservoir, the first album from Fanfarlo. It was worth the wait. My adoration for this band grows with every repeat. The melodies are full of emotion and the way the songs hang together is delicate and powerful. They're giving their music away for $1 on their web site until the Fourth of July. Give a listen and write a review or thoughts below. You can also tag a short review on Twitter #reservoir.